You very well may have not brought a car to college. In fact, on your college checklist, a car was probably not one of your essentials for college. But if you still have the need for speed (not that we recommend speeding), add some race-themed college decor to your decorations for college. 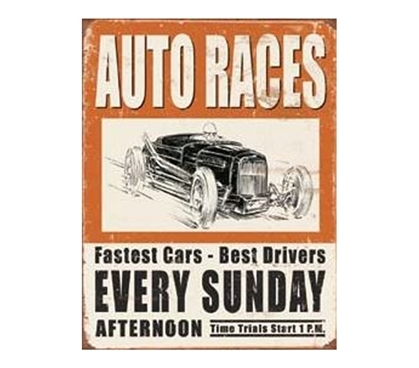 This Auto Races Tin Sign is quite retro, and it's unlikely you'll ever drive a car like that, but its message is the same: Fans of racing will want this quirky dorm decor item as part of their college stuff. Even if you had a racecar bed when you were a kid, be glad you'll at least have a twin XL bed with an XL twin comforter to sleep on now. But if there's an absence of anything car-themed amid your college supplies, then let this tin sign fill that gap.